Diversion initiatives such as recycling and composting mandates are popping up across the country as more and more local governments start to realize the value of zero waste. This is just the beginning. Once cities begin to ramp up their zero waste plans, we can expect to see other zero waste efforts that go beyond diversion to promote waste reduction, reuse, and resource efficiency. Dallas: The Multifamily Recycling Ordinance mandates recycling for apartment complexes with 8 or more units by Jan. 2020. 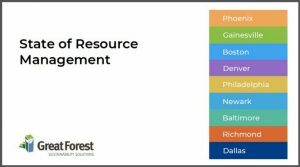 Learn more in our state of resource management in 9 cities. Portland: Commercial organics mandate requires establishments that generate 1,000 pounds or more of organics per week to comply by March 2020. Generators of 500 pounds or more would be phased in by March 2021, followed by those with 250 pounds or more by Sept. 2022. Denver has one of the country’s lowest recycling rates. As a result, Colorado adopted its first set of statewide recycling goals. The mayor’s goal is to increase Denver’s recycling and composting rate to 34 percent by 2020. Learn more in our state of resource management in 9 cities. Boston: This forward-looking city has had a recycling mandate for years and is now working towards Zero Waste so expect changes to come. Learn more in our state of resource management in 9 cities. Philadelphia: mandates recycling for businesses. See their toolkit for help. Learn more in our state of resource management in 9 cities. To start, make sure you are in compliance with all applicable local laws as they are updated. For example, NYC businesses should take note of the recently-expanded organics law (see more details below). Need help? Check out our compliance checklist. Take a look at our report on the state of resource management in 9 cities –– Phoenix, Gainesville, Denver, Philadelphia, Newark, Baltimore, Richmond, and Dallas. Get an idea of what is being mandated and encouraged across the country. Don’t see your city in our report? Just contact us. We’ve been busy getting businesses in compliance across the country and can answer all your questions. Businesses in NYC should take note of the recently-expanded organics law. Larger restaurants, chains, and grocery stores are now required to send their food waste to beneficial use. Here is some useful information for NYC businesses. This entry was posted in All and tagged regulations. Bookmark the permalink.